The ever-fashionable fashion designer Mary Kuei Boyer. 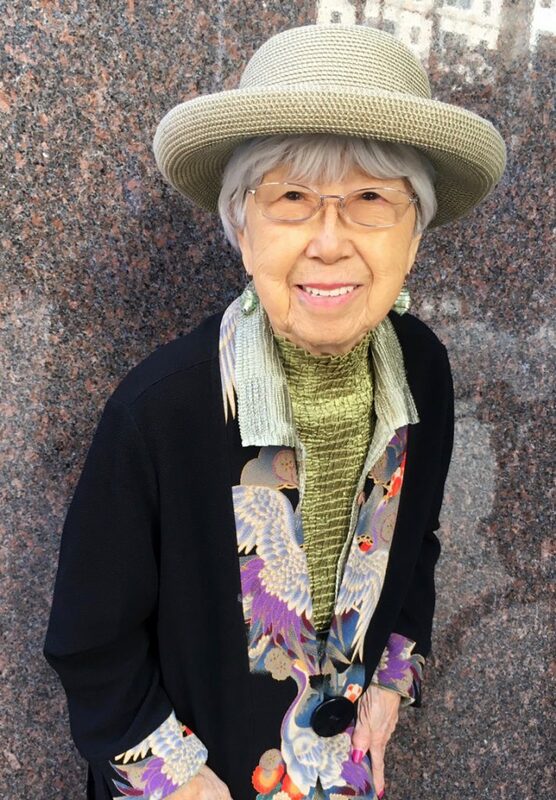 I met Mary Kuei Boyer a decade ago at an art exhibition at the Sequoias, the high-rise senior community on Geary near Gough. “I think you would like to get to know me,” she said, and she was right. We shared many long lunches and talks. She provided the entertainment, with her fast-paced stories that sped along ever faster as she became more and more excited. I was there to receive her wisdom and marvel at her ability to clean her plate. This wisp of a woman with an outsized appetite was an enigma in many ways. She was impish but thoughtful, modest but proud, outgoing but intensely private. She had a lot to teach about being alive. Born in a rural Chinese village near Beijing, she fled to Taiwan after the revolution. On the way she was captured, but escaped by kicking open the cage that confined her. Later she moved to Japan, where she held different jobs, including running a beauty parlor, cafe and bar. After marrying an American and moving to New York, she realized her dream of launching an upscale fashion business, Custom Gowns by Madame Kuei. She later moved her successful business to Florida, before eventually selling it and becoming something of a real estate mogul. For the past decade, Mary lived at the Sequoias, charming the staff and gamely participating in everything from art class to laughing class. She put in long, sometimes sleepless nights — just as she had during her fashion career — while sewing creations to be auctioned at the annual fundraising gala. Ries still marvels over Mary’s strength and resolve in traveling to Fort Lauderdale in December to say goodbye to her many friends there. “She loved to travel, but she knew that would be her last trip,” he says. He also recalled her propensity to dole out gentle fashion advice to friends. She had hinted pointedly that he could improve his sartorial panache by wearing a pocket handkerchief. When he still failed to don one after several months, she silently slipped him one under the dining table one day. In her final weeks, Mary said she was not in pain, but she was constantly hungry. Esophageal cancer prevented her from eating or swallowing much. But she remained fashion-conscious to the end. “I’m dressed like a hobo in here,” she lamented, shunning the conveniences of button-front shirts and casual sweatpants. When her dutiful daughter Lynda Boyer bought her a warm sweater, she waved it away dismissively. “I will not be seen in polka dots!” she said. I last saw Mary about a week before she died on March 21. She motioned for the small bottle of Chanel No. 5 on her bedside table, then dabbed a few drops behind her ears and a few behind mine.